Maryknoll, New York – February 23, 2016 – Six middle and high school students representing California, Louisiana, Maryland, New Jersey, North Carolina and Texas have received cash awards for their winning submissions in Maryknoll magazine’s 27th annual Maryknoll Student Essay Contest. Maryknoll magazine is published by the Maryknoll Fathers and Brothers. The 2015 essay theme, “Mission of Mercy,” asked students to share real-life inspirational stories about mercy. Students also were asked to convey the lessons learned about the need for mercy in the world. Pope Francis has declared a Jubilee Year of Mercy from December 8, 2015 to November 20, 2016. He has asked all Catholics to focus on following the example of God the Father, who, Jesus says, does not judge us harshly but offers us love and forgiveness. The contest received close to 6,500 entries from students who competed in two divisions (grades six to eight and grades nine to 12) for nearly $3,000 in cash prizes. The awards included $1,000 for each of the two first-place finalists, $300 for each of the two second-place finalists and $150 to each of the two third-place award recipients. According to Marge Gaughan, contest coordinator and Maryknoll magazine managing editor, students passionately wrote about extraordinary mercy moments that ranged from stories that touched their hearts to experiences that changed their lives. The panel of more than 50 judges comprised of Maryknoll missioners was elated to read the essays that conveyed thousands of examples of people helping others. The essays written by the first-place winners in each category will be published in the May/June 2016 issue of Maryknoll magazine. All six winning essays will be featured in the Jubilee Year of Mercy exhibit that will be unveiled at the Maryknoll Museum of Living Mission at the Maryknoll Mission Center in Ossining, New York, during the second half of the year. All winning entries also will be published online at www.maryknollsociety.org/winners . 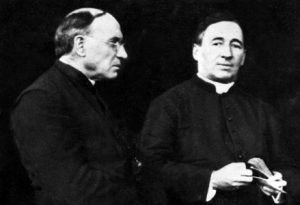 First Place ($1,000): The Bishop Francis X. Ford Award is named in honor of the Maryknoll missioner who died in a prison in China during 1952. First Place ($1,000): The Bishop Patrick J. Byrne Award is named for the Maryknoll missioner who died on a forced march in Korea during 1950. · Adriana Collins (12th grade), Huntingtown High School, Huntingtown, Maryland, Teacher/catechist: Mrs. Tina Gall.